Protect headlights against yellowing, fading and discolouration for the life of the vehicle with the application of Optimum Opti Lens. 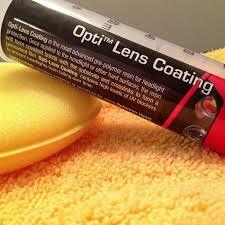 It is a resin based coating that bond with the headlight and cross links to blanket the lens with a durable, protective film. Expect perfect clarity throughout life with Opti Lens. The polycarbonate headlight lenses manufactured since the last three decades are lightweight, impact resistant and far safer than their predecessor, the glass lenses. There is one drawback with these current generation headlights though- the UV-induced yellowing, discolouration, fading. It takes away the sparkle from an otherwise perfect automobile. Intense UV radiation along with rain, pollution and other external factors, deteriorate the factory-applied clear coat on your headlight lenses. The Opti Lens Pro by Optimum Polymer Technologies is a perfect solution against fading and discolouration of headlights. 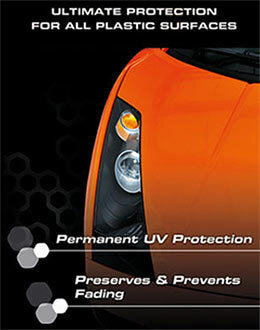 Polycarbonate headlight lenses require a stronger protection against the UV rays than your regualar paints do. Therefore, Dr. David Ghodoussi- CEO and chemist behind OPT- formulated Opti Lens Pro, a highly modified version with the highest amount of UV inhibitors in the coating. So now you have the headlight- specific coating that ensures that your vehicle’s headlights retain optimum clarity throughout the lifespan of the vehicle.